We are going to create a Shape and Color interfaces and concrete classes implementing these interfaces. We create an abstract factory class AbstractFactory as next step. 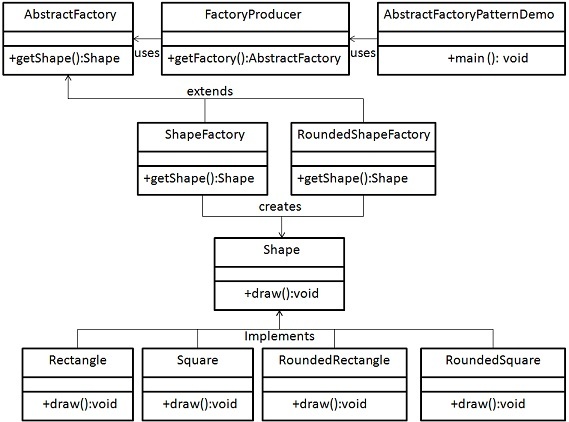 Factory classes ShapeFactory and ColorFactoryare defined where each factory extends AbstractFactory. A factory creator/generator class FactoryProducer is created. AbstractFactoryPatternDemo, our demo class uses FactoryProducer to get a AbstractFactory object. It will pass information (CIRCLE / RECTANGLE / SQUARE for Shape) to AbstractFactory to get the type of object it needs. It also passes information (RED / GREEN / BLUE for Color) to AbstractFactory to get the type of object it needs. Create an interface for Shapes. Create an interface for Colors. Create an Abstract class to get factories for Color and Shape Objects. Create Factory classes extending AbstractFactory to generate object of concrete class based on given information. Use the FactoryProducer to get AbstractFactory in order to get factories of concrete classes by passing an information such as type.